The concept of buying dress pants may seem daunting at first, especially if you’re looking for a pair for a special occasion. Although there are plenty of different designs and brands to choose from, selecting the perfect pair is easier than you might think, as long as you know exactly what to look for. In this guide, we explore five of the best men’s dress pants of 2018 to give you a better idea of what you should look for in proper men's formal attire for any event. The Haggar Men’s Cool 18 Dress Pants don’t leave much behind as they offer everything that you would expect from a regular pair of slacks. With plenty of comfortable features and the convenience of being able to wear them for any occasion, you may just be buying the perfect pair of dress pants that you’ve been searching for. Designed by a highly reputable menswear brand, you surely won’t be disappointed in their comfort and quality. Instead of being forced to go to the dry cleaner every time you wear your dress pants, you’ll have the opportunity to wash and dry them entirely at home. 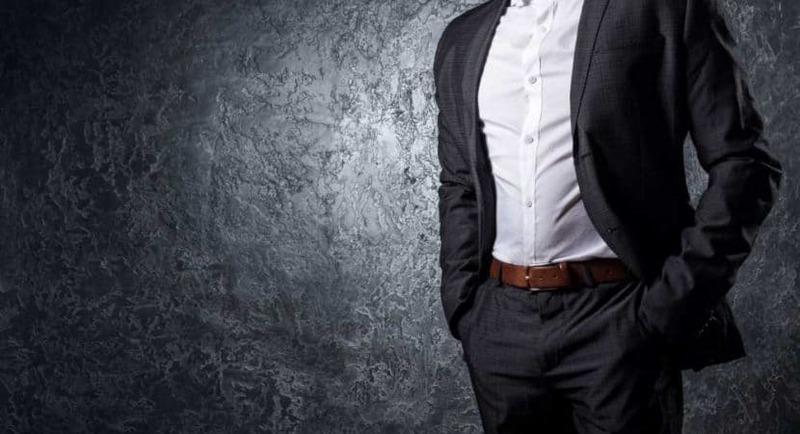 This seems to be one of the largest trends in men’s formalwear as it gives you the ability to maintain your clothing for a far less expensive cost. With the help of the non-iron technology, you won’t have to worry about wrinkles and creases throughout the day, especially if you’re the type of man who is constantly on the go. The pretreatment added to the fabric helps to ensure that you always look your best with minimal effort. One of the largest disadvantages that the Haggar Men’s Cool 18 Dress Pants has over other pants is its waistband, as it’s not adjustable. This means that you will have to have a clear idea of your exact measurements in order to find the right pair of pants. Additionally, if you gain or lose weight, you’re going to have to purchase another pair to accommodate your changing body type. Lee is an incredibly well-known menswear brand, particularly as they specialize in more high-quality and durable clothing designed for the everyday businessman and the more active outdoorsman. With the help of their dress pants, you’ll always be prepared for anything that comes your way, no matter if you’re sitting at a desk for hours or forced to walk outdoors in the immense heat. 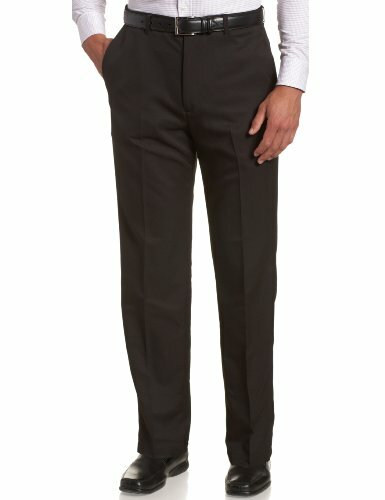 One of the unique features that we have yet to see in any of the other dress pant brands on this list is the stain repellant technology integrated into Lee dress pants. This means that you do not have to worry about stains from any food or beverages that you spilled during lunch or toner that you might have brushed on your leg while walking past the office printer. You can either choose to wash it off at the office or wait until the end of the day and wash it out at home. Similar to the Haggar dress pants, the Lee Men’s Total Freedom Dress Pants are also non-iron, giving you the ability to look strikingly handsome and well put together no matter what the occasion is. Even if you pull the pants out of your travel bag, they’ll be crisp and ready to wear right away. Another important feature to consider is shrinkage, especially if you’re going to be washing your dress pants at home. Luckily, there is little to no shrinkage when you throw your Lee dress pants into the washer or dryer at home. IZOD has always been known to have high-quality pants for a fraction of the cost of high-end designer labels and with their American Chinos, you’ll finally have the ability to dress formally without having to deal with the feeling of traditional dress pants. Designed for the more modern man, there are plenty of benefits to be had with these unique pants. Let’s take a look at a few key features offered by the IZOD Men’s American Chino Dress Pants. One difficulty many people experience with traditional dress pants is having to not only work with a zip fly but with button and hook closures at the same time. Luckily, the IZOD Men’s American Chino Dress Pants come with your traditional zip fly as well as a button closure, making it simple to get dressed first thing in the morning with little hassle. As a trend amongst the top five dress pants on the market, these chinos are also machine washable with little worry of color fastness and fading. You’ll have the ability to use your washing machine and dryer instead of having to visit a dry cleaner to have your clothes taken care of. 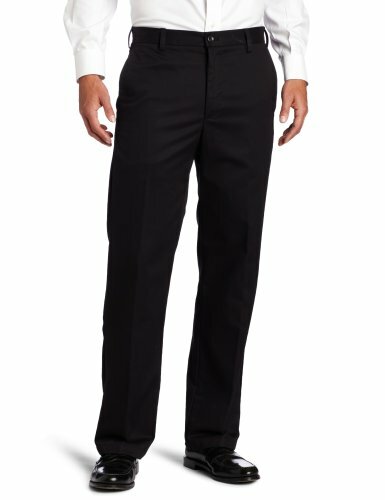 As an additional feature that typically isn’t included in traditional dress pants, the IZOD Men’s American Chino Dress Pants are lint repellant. There’s no need to worry about lint rolling your trousers before heading out on a date or walking into an important meeting, they’re ready to wear as soon as you pull them out of your drawer or closet. 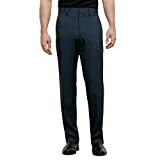 Known to be one of the more high-end brands of men’s clothing, the Kenneth Cole Reaction Men’s Dress Pants surely strike a note with men that are searching for modern and clean cut formal wear suitable for absolutely any occasion. With a slimmer fit than the other dress pants on this list and a structured appeal, they’re appropriate for anything ranging from weddings to business meetings. Having the ability to wash your formalwear at home not only helps you to save money but time as well. In the event that you forgot to wash your dress pants and you have a meeting first thing in the morning, all you have to do is throw them into your home washing appliances and they’ll be ready for you when you need them. Based on the type of person you are and the level of comfort you’re searching for, the rigid waistband in the Kenneth Cole Reaction Men’s Dress Pants may be exactly what you want. You certainly won’t have to worry about an expandable waist slipping throughout the day and it also helps to keep your dress shirt and undershirt in place as you stand and sit. 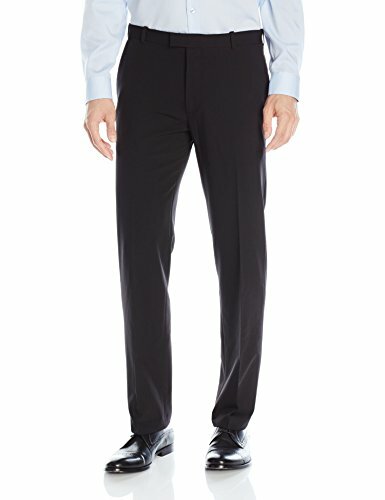 Although there are plenty of great attributes held by the Kenneth Cole Reaction Men’s Dress Pants, there are a few things missing that would help to make them more convenient. For example, a non-iron design would help to get rid of the need to press the pants prior to wearing them, as well as a static-free material would help to cut back on the time it takes to get ready. As the fifth and final pair of pants on this list, you’ll surely be impressed with the developments made while designing the Van Heusen Men’s Flex Dress Pants. They accentuate the same classic appeal of traditional trousers but with a couple of advancements that help to make wearing them more comfortable and simple than other brands on the market. The single most fascinating feature included in these trousers is their shirt-gripper technology, which is purely designed to help you get ready and stay ready throughout the day. With a specialized waistband that is designed to keep your shirt in place, you can stand, sit, run, and walk without having to worry about looking disheveled or out of place. It’s a highly recommended feature that should be included in every pair of dress pants for active men. Another feature you’ll surely appreciate is their flexible design, which helps to transform the pants from traditional formalwear into an article of clothing that moves with you. Your body will be able to breathe and feel comfortable throughout the day and in different types of weather ranging from hot to cold. Easy to throw in the washing machine and dryer, you won’t ever have to worry about visiting the dry cleaner to take care of your pants. In an effort to choose the perfect pair of dress pants, there are three main factors to take into consideration: breath ability, flexibility, and quality. With that being said, it’s easy to see why the Van Heusen Men’s Flex Dress Pants are truly the best choice when it comes to selecting the perfect piece of formal wear for every occasion. Constructed out of a blend of polyester, rayon, and spandex, these pants are incredibly breathable and appropriate for all occasions. If you’re out in the sun for most of the day, you won’t have to worry about sweat stains or uncomfortable levels of heat, and they help to insulate your legs during colder weather. 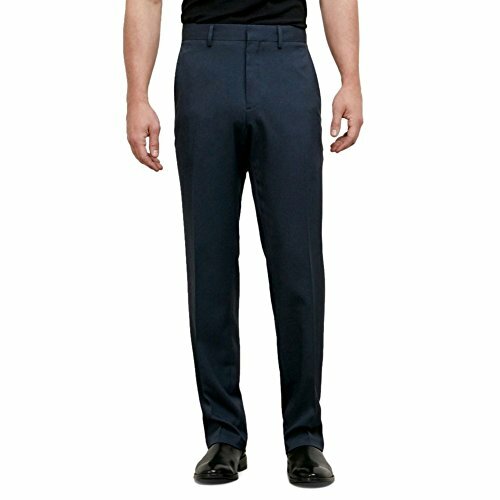 In terms of flexibility, the Van Heusen Men’s Flex Dress Pants are outstanding as they offer not only a comfortable stretch in the legs but around the waist as well. No matter what your body type is, you’ll have the ability to feel comfortable in the pants at all times. With superior build quality and impeccable construction, you won’t have to worry about unraveling threads or hems falling apart. Although the pants do require tailoring in an effort to get the ideal length, they’re essentially ready to wear right out of the box. At the end of the day, it’s important to have a pair of dress pants that you can rely on and the Van Heusen Men’s Flex Dress Pants surely impress.